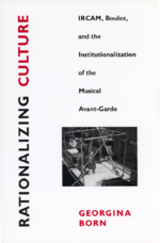 Anthropologist Georgina Born presents one of the first ethnographies of a powerful western cultural organization, the renowned Institut de Recherche et de Coordination Acoustique/Musique (IRCAM) in Paris. As a year-long participant-observer, Born studied the social and cultural economy of an institution for research and production of avant-garde and computer music. She gives a unique portrait of IRCAM's composers, computer scientists, technicians, and secretaries, interrogating the effects of the cultural philosophy of the controversial avant-garde composer, Pierre Boulez, who directed the institute until 1992. Born depicts a major artistic institution trying to maintain its status and legitimacy in an era increasingly dominated by market forces, and in a volatile political and cultural climate. She illuminates the erosion of the legitimacy of art and science in the face of growing commercial and political pressures. By tracing how IRCAM has tried to accomodate these pressures while preserving its autonomy, Born reveals the contradictory effects of institutionalizing an avant-garde. Contrary to those who see postmodernism representing an accord between high and popular culture, Born stresses the continuities between modernism and postmodernism and how postmodernism itself embodies an implicit antagonism toward popular culture. Georgina Born is University Lecturer in the Sociology of Culture and Media at the University of Cambridge, and Official Fellow of Emmanuel College, Cambridge.